Beachwood Brewing	Long Beach, Calif. True to beer. It’s more than just a marketing slogan. It’s a philosophy that drives us every day at Beachwood Brewing. We are a brewery wholly dedicated to keeping the tradition of independent beer alive, not only for us but for the continued growth of our industry. As stewards of independent beer, we get to go to work every day primarily concerned with mastering our craft; we make decisions that are not beholden to pure profit; we experiment with styles and operate with the confidence that creativity and quality are our top priorities. By staying independent and putting our products first, we remain true to the breweries who created this industry and true to those who continue to keep beer innovation alive. In solidarity with our fellow independent brewers, we’ve been vocal with our criticism of corporate business practices. Somewhere along the way, America came to view large corporations as a positive force, but it is small businesses that spur local economies, push innovation and create communities as rich and diverse as the beer we make. 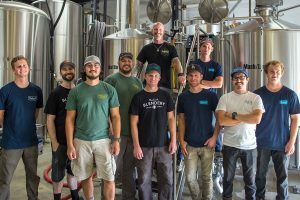 Why support independent breweries who are staying true to beer? Because the culture of craft depends on it.